Details, details, details! You won't believe it. They thought of everything on this ride, and it's spectacular. The special effects are amazing. Interesting and alluring from start to finish. Can't say enough good things about this ride. The Haunted Mansion has almost everything a great attraction should. It is accessible -- and appealing -- to all ages. It has intense attention to detail and immersive theming. It has super-high capacity, keeping its wait times down, and also gives an experience on the longer side; perhaps the best reward-for-wait attraction out there. It even features catchy music. The only thing you could ask for is more thrill, but if the result is no height restriction, it's hard to complain with everything else it has to offer. The Haunted Mansion is a classic Disney dark ride located in Liberty Square in the Magic Kingdom. The attraction featured a major refurbishment (June 6, 2007 - September 12, 2007). Once inside the wrought-iron gates that surround the stately mansion, guests step gingerly past the home’s cemetery, with tombstones featuring witty epitaphs to the dearly departed. Summoned to the front entrance, guests enter the foyer and then an octagonal gallery that stretches…and stretches -- or does it? Paintings on the wall grow longer, but the floor and ceiling never seem to move. Other portraits morph into ghastly images, including a dapperly dressed gentleman that transforms into a decrepit corpse. Guests board doom buggies for their ghost-guided tour of the mansion. Sound and lighting effects create the mood as the darkened, eggshell-shaped vehicles glide silently through the cobwebbed library, conservatory, hallways, ballroom, attic and graveyards. Guests even ride through Madame Leota’s séance, a collection of flying objects choreographed by a disembodied spirit trapped inside a crystal ball. Synchronized speakers inside each doom buggy allow a narrator to explain the supernatural scenes to riders. 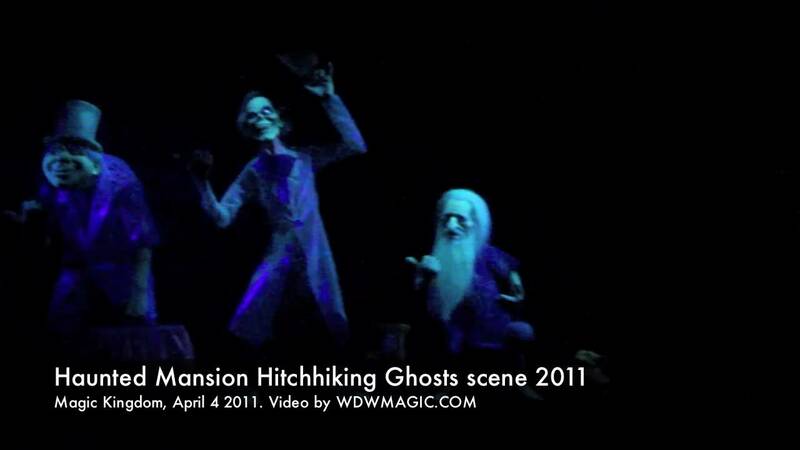 Thanks to a little Disney magic, ghostly apparitions seem to appear out of thin air to dance and sing in certain rooms. An eager, “hitchhiking” ghost even appears inside each doom buggy at the end of the ride to follow guests home. Ride Duration: 7 mins, 30 seconds. Ride System: Omin-Mover with 360 degree rotation of "Doom Buggy". Building Architecutre: It is speculated that the Harry Packer Mansion, a gothic mansion built in 1874 in Jim Thorpe, Pennsylvania was the inspiration for the building architecture. The five singing busts in the graveyard scene warble the attraction’s theme song, “Grim Grinning Ghosts.” Though sometimes mistaken for Walt Disney, the face on the bust farthest to the left actually belongs to Thurl Ravenscroft, the song’s soloist. Ravenscroft is known to millions of fans as the voice of Tony the Tiger, the mascot of Kellogg’s Frosted Flakes cereal. The witty epitaphs on the tombstones at the attraction’s entrance pay tribute to the designers, developers and artists who originally created The Haunted Mansion. One of the newest tombstones honors the late Walt Disney Imagineer Leota Thomas (her maiden name was Toombs). Periodically, Leota’s tombstone can be spotted slowly opening and closing the eyes on its sculpted head. Rest in peace, brother Huet. We all know you didn't do it. R.I.P., good friend Gordon. Now you've crossed the river Jordan. Master Gracey laid to rest. No mourning, please, at his request. Farewell. At peaceful rest, he's brother Claude. Planted here beneath this sod. Here rests Lawful R. Bender. He rode to glory on a fender. Dear departed brother Dave, He chased a bear into a cave. Here lies a man named Martin. The lights went out on this old Spartan. Dear sweet Leota, beloved by all. In regions beyond now, but having a ball. Madame Leota also graces the crystal ball in the attraction’s séance scene. 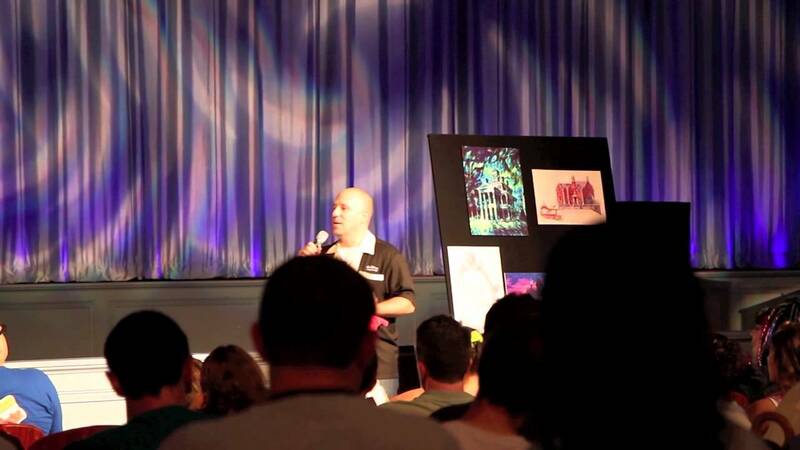 Leota Thomas provided the face for the crystal ball, and voice artist Eleanor Audley provided the voice. Audley is also famous as the voice of the evil Maleficent in Disney’s classic animated feature “Sleeping Beauty.” In addition to its home in the Liberty Square area at Walt Disney World Resort, The Haunted Mansion is featured at Disneyland Resort (in New Orleans Square), Tokyo Disneyland (in Fantasyland) and Disneyland Paris (known as Phantom Manor and located in Frontierland). It is the only Disney attraction to be featured in four different park “lands” worldwide. Ghosts aren’t the only ones hiding in The Haunted Mansion. There are several “Hidden Mickeys” to be found as well. The ballroom scene features one of the most famous -- a plate and a pair of saucers on the dining table form Mickey’s familiar silhouette.